Has a warm and welcoming setting, full benches, and large windows. 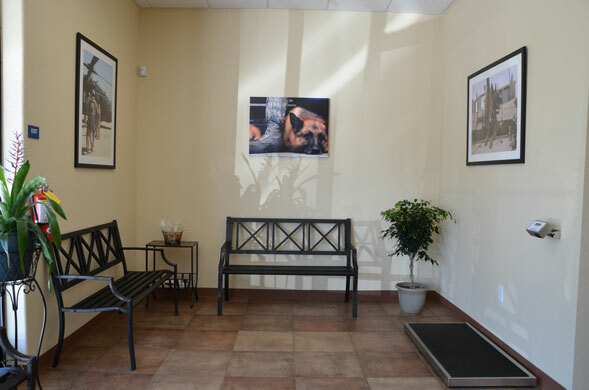 Enjoy reading or chatting with other clients prior to appointments or while we work with your pet in treatment. Our staff is more than happy to check you in, answer questions you may have, schedule appointments, and help you with anything else you may need during your visit. Doctors and nurses conduct exams and consults in our rooms. 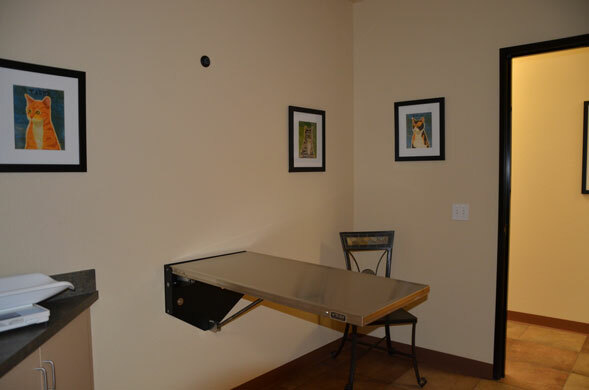 Each room has a fold down table that allows staff members to get an up close look at the smaller pets. But we are just as comfortable getting on the floor with the big guys. Clients can be reassured that they are involved in their pet's health and many important conversations take place in the exam room. Laboratory tests can be conducted quickly by our knowledgeable nursing staff. The equipment used in house is powerful and accurate. Doctors can review lab work within a short time period and provide clients with valuable information regarding their pet’s health. 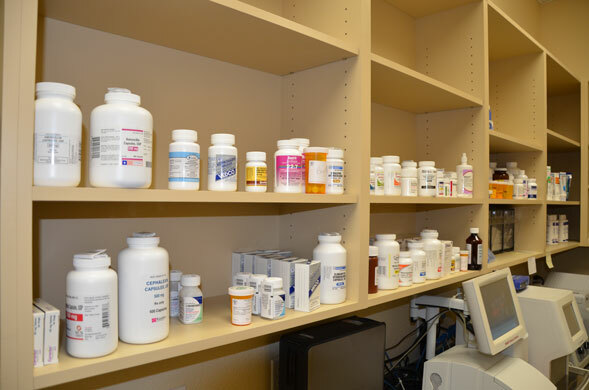 The hospital conveniently keeps many medications in stock for our clients. Medications are filled on a regular basis and the staff are familiar with side effects and interactions in case your pet has many prescriptions. 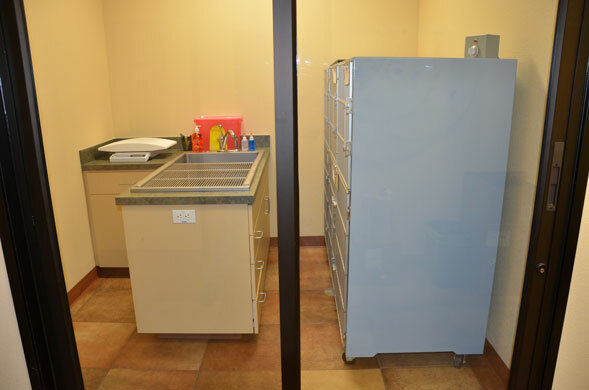 Is kept in pristine order to accommodate many types of surgery. 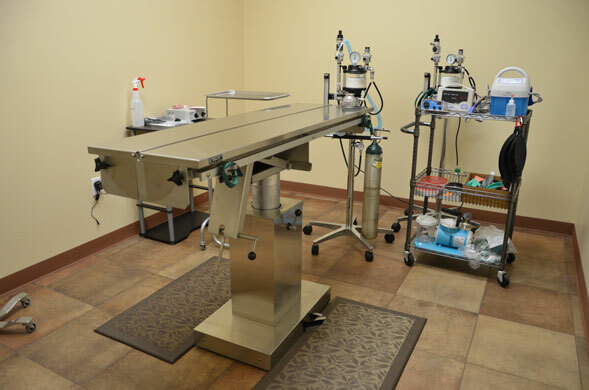 Routine spays and neuters all the way to emergency exploratories, caesareans, and orthopedic procedures are conducted in the operating room. 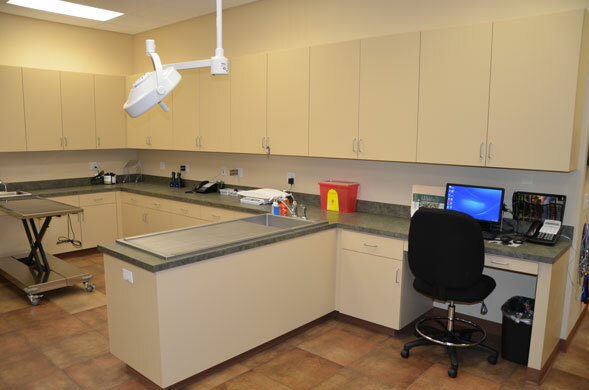 The surgical prep area is designated to make sure all our surgery patients are ready for their procedures. Patients are monitored closely before, during, and after procedures and are provided optimal post operative care. This area is the heart of the hospital. Nurses and doctors work together to conduct basic to extensive procedures and treatments. 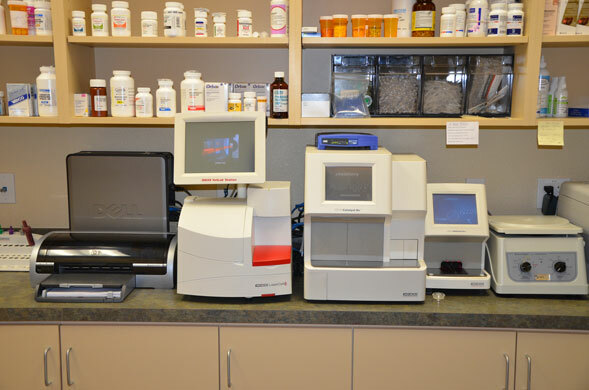 All our hospitalized patients are monitored in this area and are kept under a close watch. 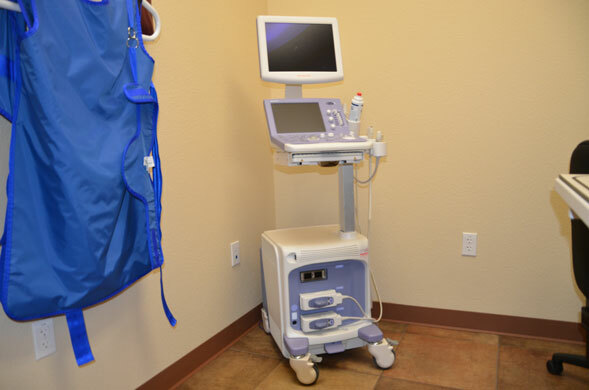 In treatment the staff can easily utilize the diagnostic equipment in the hospital. Digital radiology is the newest form of obtaining x-rays. These films are immediately available for the doctors and are a valuable aid in making an accurate diagnosis. X-rays can also be emailed and put onto a CD for clients, specialists, and referring doctors. Designed specifically for the pets with infectious diseases. Patients can be monitored closely by staff without the chance of cross contamination. Dogs have their own room to relax in while they stay in the hospital. 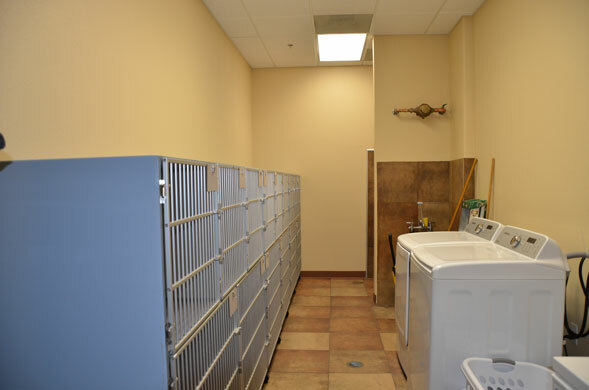 Each pet has its own individual kennel to stretch out in. This is another valuable tool for our doctors and nurses. The images obtained in ultrasound can provide information that no other machine can. 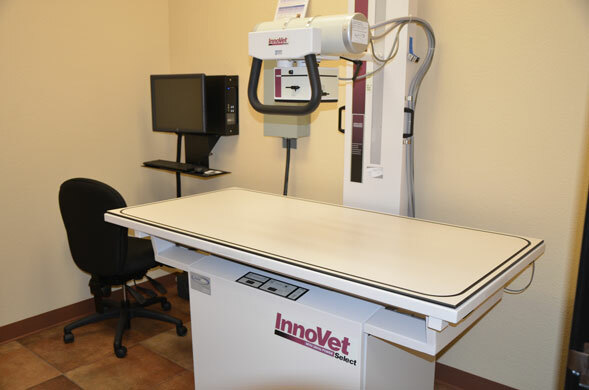 Each member of the team is trained to accurately read the screen and keep your pet comfortable while doctors and technicians painlessly search for answers.